As the public hearings of the Banking Royal Commission conclude, and the level of consumer distrust can be seen to rise, we ask what financial services brands can do to survive in the future? What will consumers demand of them? What can they do to start rebuilding relationships with their clients? BrandMatters' Managing Director, Paul Nelson, provides his insight into how financial services brands need to consider their next 12 months. What factors led to the current environment in the financial services sector? an under-resourced and slightly intimidated regulator – ill-equipped to detect or handle the sheer scale and number of scandals that have occurred over the decades. At the heart of it all, has been a culture of self-preservation (either market or personal returns, or both) at the expense of the individual customer or client. It has taken some time for the Commission to delve into how deep this all goes. Looking back on the timeline, it was as early as 2008 when Jeff Morris first blew the whistle on a CBA financial planner who was clearly taking advantage of several elderly and vulnerable clients. This was only scratching the surface of the scandals that were about to appear. Even the regulator ASIC was brought into the spotlight in 2014 when in a series of investigations by Fairfax Media and Four Corners further uncovered facts that ASIC had failed to act on several whistleblower complaints – it was this scandal that then led to the Senate inquiry. With the Senate recommending a Royal Commission into Australia’s banking and financial services industry, it was clear there was the potential to uncover misconduct in an industry deemed as one of the most trusted – the one that manages and controls our money, our superannuation funds, our hard-earned investments and life savings. So, as the hearings continue, and more truths are revealed, it appears that the customer and their needs have become very much sidelined. The main game has been played at the customer’s expense as the industry’s profits, bonuses and shareholder returns kept soaring. The focus on risk management, was around risk to future revenues including incentive schemes and remuneration structures rather than protecting customers. Throughout the entire 70 or so days, the commission has repeatedly come back to two connected areas: remuneration and culture. There is widespread agreement that inwardly focused remuneration schemes that prioritised sales and profit over customer benefit, have caused a great many of the sectors problems, and created a ‘win at all costs’ culture. What will consumers demand of FS brands in the future? In the past 6 months since the Royal Commission commenced, consumer satisfaction ratings with banks has dropped from 81.2% to 78% as reported by Roy Morgan. A 4% drop doesn’t seem so bad and would indicate that the clear majority of customers are still relatively satisfied with their bank. However, it is important to note that this is the lowest satisfaction rating banks have seen in more than seven years. Are customers resilient or feeling completely disempowered across the whole situation? In terms of what consumers are expecting or will demand from FS brands, in this situation, it certainly needs much more than just an official mass produced letter from the corporate communications team, or a press release issuing an apology. There needs to be fundamental evidence of change, including a meaningful change in the business model and evidence of positive brand values. The top 10 brands consumers trust in Australia at the moment do not include the top 4 banks – ING and Bendigo Bank are the only brands from the financial services industry to make the list. There is no doubt that trust in brand is difficult to earn, very easily lost and once lost even more difficult to regain. As inconvenient as it might be, a recent report indicated that 1.3 million Australians are considering opening new bank accounts in the next 6 months – so there is no room for complacency by any of the banking brands. Brands in other sectors are demonstrating customer service excellence. FS brands can learn from other industries and put technology and transparency first. What immediate and long terms changes need to occur for the industry and the industry’s brands to move forward in future? First and foremost, there must be a united front. A true commitment from the entire industry to work towards rebuilding consumer trust. A collective action and a collective promise made, shared and then kept. Admittedly much easier said, than done. What’s needed is an entirely new approach, a new norm to be created where customer centricity is the key focus – in the knowledge that from truly satisfied customers profit will prevail, and shareholder returns will come. A new focus on serving and improving the lives of their customers will prove they can be profitable and trustworthy at the same time. Again, you may think this sounds very idealistic, but that is how dramatic the shift needs to be – a bank can put its customers first, can have a broader purpose, can nurture and create a new and positive culture. One that focusses on delivering for customers and that isn’t all about internal remuneration. This needs to be a significant transformational change that creates a culture of putting customers first. For financial service organisations, this needs to be a massive cultural shift. One that is driven both from the top down and the bottom up. And a new employee value proposition is needed to bring meaningful purpose back into the equation. A deeper understanding of the issues would enable both policy and behavioural change with reforms which need to be communicated to all stakeholders in order to achieve the desired outcomes. In the recently released G30 Report on Banking Conduct and Culture, titled BANKING CONDUCT AND CULTURE A Permanent Mindset Change, of which Ms Kelly co-chaired, many additional recommendations can be found, within the Executive Summary and throughout the entire report. There are a great many observations in the report together with 12 separate recommendations. Ongoing relaxation around regulation and licensing allowing a greater level of competition in the industry. This will force the major players to be fairer and more responsive to their customers’ needs. We are already seeing new entrants and disruptors entering the market including neo and fintech banks. ING seem to be leading the way in putting the customer first, and they are being rewarded for it. Obviously appropriate regulatory oversight of this expansion goes without saying. In terms of the official regulator – change needs to occur, including resourcing – but beyond that what the new form or system of regulation will look like, remains to be seen. A new shared vision and code of practice to create shared value for a much wider group of consumers, investors, and the broader community. An entire industry-wide, as well as an individual focus around remuneration structures and incentive schemes. This needs to fundamentally consider the link between quantitative sales targets and compensation, to minimise misconduct and help individuals ensure that they prioritise meeting customer needs. A new code of conduct, or an industry-wide charter. Clearly, it will be very difficult to align competing interests, businesses and brands, but if not now, with this burning platform, then when? Finally, FS brands need to start with the biggest piece in the complex world of brand – and that is a vision. A reason to exist, a reason to get up out of bed, to serve customers and do what you do. A vision that is compelling and drives a positive internal culture. A focus on culture that serves and encourages the appropriate behaviours through every strata of the organisation – including middle management and especially client-facing staff. For financial services brands that means creating a vision that creates buy-in from all employees to say ‘hey, we are here for a broader purpose than simply profit’ – we must be here to do more than just create value for shareholders. Is the industry up for this level of change? Well, the jury is still out on this. However, there are already signs of change. The disposing of wealth and insurance businesses and other potential conflicts of interest, together with a renewed focus on their core functions should see the capacity to drive new and better outcomes for customers. This includes being far more sensitive to customers human needs. For financial services brands - it is time to listen, learn and act. We believe the time is right for change. With significant rewards for customers, for brands and shareholders. In terms of a make or break moment for FS brands – it feels like this is the moment to take positive action. Be bold, make the first move. Strawberries - A crisis of confidence. There’s no doubt that the crisis facing the strawberry industry could not have come at a worse time for the strawberry farmers of Queensland. Within days of a needle being found in a punnet of supermarket-bought strawberries, and at the peak of the Queensland strawberry season, all punnets of Queensland strawberries were withdrawn from sale. Not only is this a major blow to strawberry farmers and the people who work in the processing, packing and distribution chain, but it now appears that a number of overseas trade partners have blocked Australian strawberry imports as well. This crisis can’t be classed as a “usual” corporate crisis situation. There’s no specific company scandal such as executive misconduct, an act of violence, equipment malfunction or security breach. In fact, there’s not really a specific company that’s been targeted. It’s an industry-wide crisis, and as such needs to be addressed in a different way than the usual corporate crisis situation. Usually, crisis situations are dealt with through a proactive crisis management plan – acknowledge the problem, get outside help, seek to isolate the specific brands and markets involved, monitor key public messaging and respond on the front foot. So what can the strawberry industry do? The biggest challenge facing the strawberry industry is to restore public confidence and provide ongoing certainty about the safety of the processes and distribution of their product. They need to take charge of the situation, and for this to occur, communication is key. The public need reassurance that measures have been taken to protect consumers from further incidents. Some measures are already in place, for instance, metal detector checks from the production process through to the supermarket sale. This is a positive and active measure that will help reassure the consumer. The industry could also publicly seek assistance and support from the major chains and distribution outlets. After all, they can suffer reputational damage as a result of this crisis too. And never underestimate the power of the public to rally behind an Aussie farmer in trouble. The public campaign to “cut it up, don’t cut it out” is gaining traction and being promoted through TV, radio and social media, and with a couple of high profile, fair dinkum Aussies endorsing the campaign, it can only help to generate a positive reaction to the strawberry “brand”. The industry could also get social media and high profile personalities involved – there’s nothing like social media to spread a message. Traditional media can also play a part, with breakfast TV and radio, evening news and lifestyle programs focussing on positive stories, and support of the farmer and their communities. Why not give strawberries away, not throw them away. Hand out cut up strawberries in high profile locations, with information about their nutritional benefits and taste qualities. There’s nothing positive about images of strawberries being bulldozed. And finally, get a PR firm involved. They will present, craft and manage media messages and attention, organise a communications plan for both now and in the future and implement a risk management plan for any future crisis situations. A good investment and something that would really have helped in hindsight. And what happens if they don’t do something? The industry must proactively respond. Otherwise, they risk the remainder of this season’s sales, and possibly next year’s as well. The steps are clear – remove the risk, control the commentary, restore confidence and get the public on board. And buy some delicious strawberries! Whether you are creating a new brand or refreshing an old brand, your brand strategy, story and marketing strategy is one of the most important steps you will take in building your organisation. Your brand should give your product or company a unique personality, communicate your point of difference, attract the brightest and best people and be compelling to your target audience. At BrandMatters, our belief is that strong brands sit at the intersection of strategic insight and creative magic. Our team have been creating Australia’s strongest brands for decades (Paul Nelson – BM’s head honcho has been in the game for longer than he wishes to admit) with experience across a range of industries, including FMCG, Financial Services, Education and Fintech. In some cases our clients come to us with a brand conundrum, a brand that just isn’t cutting through or a brand that fails to talk to the target audience. In other cases they come to us with nothing at all – we love brand creation, we live and breath brands and the idea of giving birth to a brand excites us to no end. Choosing the right brand agency to work with can be a challenge; you need to consider your budget, but you should also feel comfortable that the agency is the right fit from a vision and values perspective. As a brand agency, our values are front and centre in everything we do. A focus on listening, empathy, delivery, respect and growth is what makes working with us unique. And we wouldn’t be an agency worth our salt if we didn’t ensure these values weave their way through everything we do. We have developed a methodology which is based on reducing complexity, maximising stakeholder engagement, ensuring alignment with your business objectives - and of course achieving results. It see’s us turn data into insights, vision into a brand and messaging into marketing strategies that stand out for our clients. During this phase we focus to understand your business – including your business goals, marketing objectives, market, customer and competitors. Our aim is to clearly define and articulate your challenge – by not only mining the opinions of your team but also your customers, stakeholders and partners. This indepth research and insight gathering process is the key to the success of the subsequent phases. But it’s not just the data that we gather, through a specialist approach to quant and qual research – but our ability to turn this data into insights. That’s because we innately understand why people do what they do (ourselves included), and so we are able to share with you the fundamental truth of why your audience behave the way they do towards your business. Every client is different and this phase can range from desk research to indepth interviews, brand tracking, qualitative and quantitative research. We will recommend the most effective mix of research to uncover the sights required to get the brand strategy right. During this phase we create your brand strategy. We incorporate the brand insights uncovered in phase 1, along with our experience, industry benchmarking and of course creativity to craft your brand positioning – a definition of your uniqueness in the market place – your brand positioning will help you have a clearer picture of what your brand should communicate – at every touch point. From here, you can choose to go deeper, defining your brand architecture if you are planning on taking to market multiple offers, and the communications tools that express your point of difference consistently, in a way that resonates with your audience. As part of this phase, we also make recommendations on the naming of your brand, or renaming, or rebranding if required. In terms of your brand identity, our senior designers will use the knowledge gained from the strategic insights and brand positioning to inspire development of a new visual identity. This includes logos, colour palettes, graphic devices, typography and image libraries. This is where your unique positioning will start to feel real, as strategic rigour and creative excellence combine. In this phase, we will help you bring your brand to life with consistency as the key. We express it visually, verbally and experientially, across all touchpoints and channels. We develop your brand stationery, website, templates and any other communications collateral. To ensure consistent application of your brand, we develop comprehensive brand guidelines for employees, suppliers and partners. We can also develop your go-to-market strategy and execute campaigns for your customers and employees. While we believe phase 1 and 2 are important – a winning strategy would be nothing if it was not implemented or executed with excellence. Tracking the success of the activity and brand health is also an important part of this phase – with tracking you can enable your brand strategy to be agile – learning from experience and improving along the way. Your brand will hold incredible value over time, if nurtured and respected. There are many agencies out there – some specialise in digital marketing, some in coming up with creative concepts. Our speciality is insight driven, strategic brand development and execution. Get in touch so we can discuss your situation and show you how our guiding principles to brand creation can help you grow your brand into your most valuable asset. Paul Nelson was interviewed by Sarah Porter BBC News, on the role of brand loyalty in Apple's success. As part of our brand commentary series, each week members of the BrandMatters team will discuss some of the week’s biggest, and most newsworthy, brand challenges. Building a strong brand can be an expensive exercise. Recent news articles have reported that a single advertisement in the 2018 Super Bowl would easily cost upwards of $5 million. Whatever size your marketing investment is, successful companies need to continually ask themselves - what is the actual return in terms of building a solid reputation, and maintaining a strong, trustworthy brand? Tracking ROI of your advertising investment has become a lot easier in terms of click throughs, conversions and sales revenue, but understanding the impact of your marketing efforts on your overall brand awareness, perception and acceptance is just as important, especially for the longevity and success of your business. Brand tracking is a common quantitative method of measuring changes in brand perception over time. Habitually tracking can keep your brand on track and also provide opportunities to tweak or pivot if necessary. It quantifies ROI through looking at shifts in brand saliency, consideration, brand imagery and referral levels before and after any marketing activity. It can also lead to marketing improvements and guide strategic decision making by highlighting where your brand is strong, what activity is working and where there is opportunity for improvements. Health checks on your brand are as important as health checks for yourself. Early detection of a problem can mean the difference between success and failure. Receiving an objective assessment of how your brand performs in the minds of your clients or consumers, will provide you the necessary insight on whether your marketing efforts are working, whether your customers are understanding and receiving the message you intended, and your brand integrity is tracking in the right direction according to your vision. What do you need to consider in your brand tracking journey? A brand tracking exercise varies depending on the depth and method you choose, but what most determines cost is who you decide to survey. BrandMatters would recommend that while it’s important to understand your brand amongst target audiences, having a broader perspective of your brand in the general market can also help you see opportunities who may have otherwise overlooked. Measuring and monitoring your brand can be done annually, ongoing throughout the year, or intermittently post campaign activity. Again, it all depends on the level you are investing in the brand awareness and how quickly and accurately you hope to keep track of the results. Brand tracking can be done from within, for example, surveying your customer database or externally with the help of an agency. BrandMatters can design and implement a tracking program for your brand, and deliver the insights in a way that will help your team stay focused on execution of the marketing activity. As an added advantage, for B2B businesses, we have an active normative database of 15,000 business owners and decision makers that you can tap into from an overall market perspective of your brands performance within a B2B context. The two can be combined to give an understanding of the variation between your own customers and the general market. Businesses who fail to make their brand investment accountable lose the opportunity to improve and refine their strategy going forward. Brand tracking should uncover strengths you can build on and challenges you can address — and suggest changes you should make to your brand strategy. Get in touch with our research team at BrandMatters and we can prescribe the best brand tracking program to keep your brand at its optimal health. You may also wish to download our Guide to Brand Research which provides valuable information on the different types of brand research, and provides you with a toolkit for managing your brand research project. Imagine having a clear plan for all your marketing activity, one that is informed by years of experience and a deep understanding of your audience. Marketers have known for years it’s not just what you do, it’s how you do it. And the key to a successful rollout of marketing activity is clear-minded, researched and informed marketing planning. Planning for marketing ensures you not only understand your audiences, but also when best to communicate to them. For your marketing function it provides a step by step calendar to deploy, providing the sense of ownership and participation. For clarity of activity, it sets out a calendar of content, so your key messages can reach your different audiences consistently and in a way that is manageable. For your business, it demonstrates the marketing function not only understand the offer but can drive and generate further demand in a methodical and pragmatic way. For your Board, it delivers assurance that the firm and its offer are being promoted in the best and most effective way within a competitive and crowded marketplace. Keep it realistic: Whilst all singing all dancing advertising and celebrity endorsements are great in theory, when you are a small business they aren’t exactly practical. Make sure that your marketing plan takes into account the realistic budget of the business. Deliver consistency: Just when you are tired of saying it, your audience is just starting to hear it. Consistency built into all of your plans is essential so your message cuts through. Planning for external marketing activity will certainly engage your external audiences, but what about internal audiences? All your people are brand ambassadors, and if they also believe in the messages your marketing seeks to deliver, they become living and breathing brand marketers for your firm. Engaging internal audiences is critical for internal buy in, internal understanding, internal advocacy, which in turn externalises and further strengthens your marketing. Word-of mouth, social media, referrals: all of these are tools of marketing and proactively planning to activate your internal audiences to deliver these is a powerful tool. Whether your year end is June 30, or based on the calendar year for 2018, marketing planning is essential for your firm to come out strong in the first half of 2018. Imagine being recognised in your market place, with your customers being clear on exactly what you offer, and the benefit you deliver. Marketing planning is essential to deliver that aspiration. Almost every business we spoke to as part of our Brand Leaders 2017 Report, and many of our clients, are reorganising around customer segments, and have comprehensive customer experience (CX) measurement programs in place. All our brand leaders agreed that delivering superb CX is important for the survival and future growth of any business. They also all agreed that a strong brand is vital to organisational success. However, there differing thoughts on which should take precedent: brand or CX. It goes without saying that creating a brand that doesn’t delight customers out in the real world is futile. Similarly, crafting customer experiences without the guidance of your brand will result in variable customer interactions with no clear direction or substance. The brand should guide customer experience at every customer touchpoint. 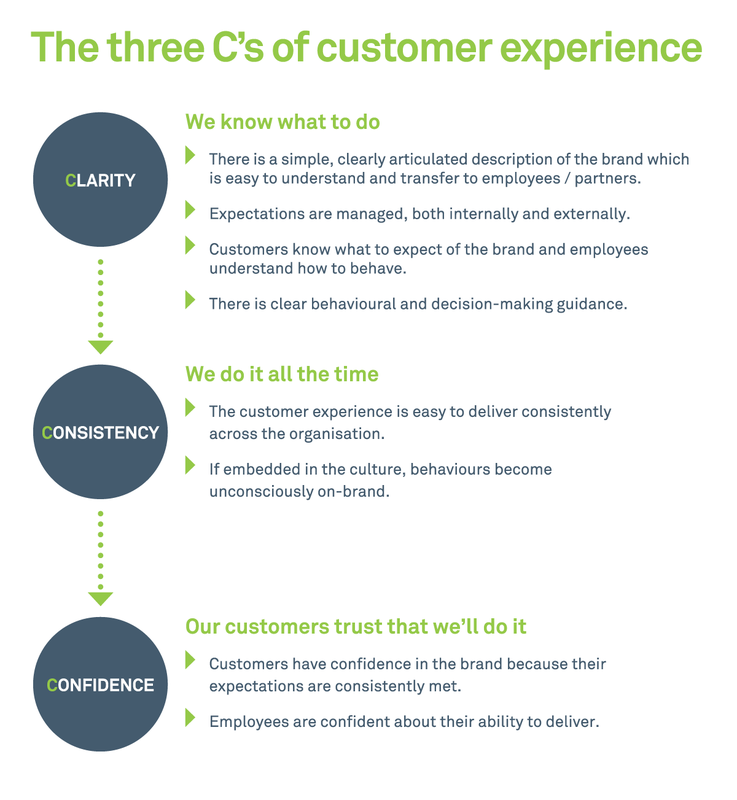 Brand delivers three C’s vital to CX. Its greatest strengths in supporting businesses in their mission to delight customers are Clarity, Consistency and Confidence. Here’s how brand delivers these three C’s. When brand is placed at the heart of your organisation, it helps drive CX in many ways, and therefore has a much clearer impact on organisational behaviour and performance. By ensuring that your brand permeates every area of your organisation, you will not only deliver a superior customer experience – you will demonstrate value to the C-suite, and measurable ROI for your brand.